The Dryden Eagles went 3 for 4 in court sports today. The Junior Girls Volleyball team defeated the Broncos in four sets, 25-19, 24-26, 25-19 and 25-9. 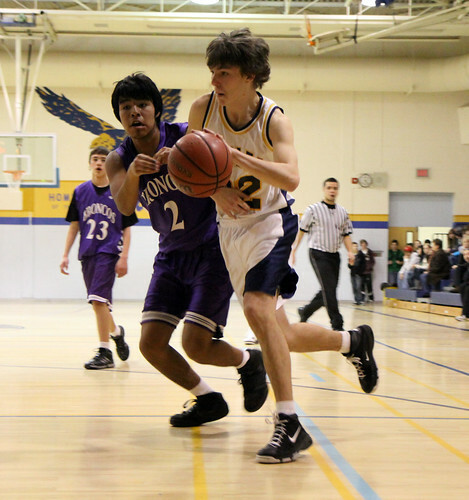 The Junior Boys Basketball team chalked up their first win of the season in an edge-of-your-seat 41-35 overtime victory. The boys were tied 33-33 at the end of regulation, but pulled ahead in the five minute overtime period. Leading all scorers were Caine Benham, 12 points, Kurtis Burnell and Josh Kitt, 11 points each. The Senior Girls Volleyball team dispatched the Broncos in three straight, 25-12, 25-12 and 25-14. The Seniors Boys Basketball team had a rough time with the Broncos, dropping 41-19. See you at the Dryden Arena for Boys Hockey Action!